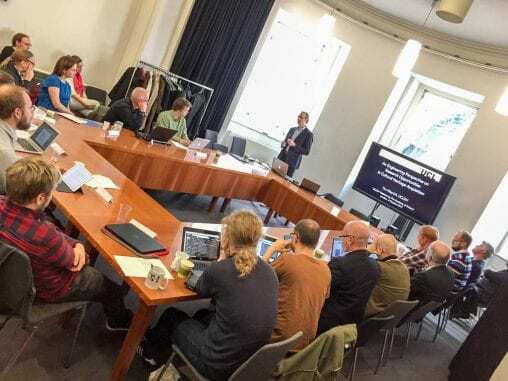 The Bentham Hackathon took place between 20-22 October 2017; a partnership between the Transcribe Bentham team and IBM, along with the support of UCL Centre for Digital Humanities and UCL Innovation and Enterprise. 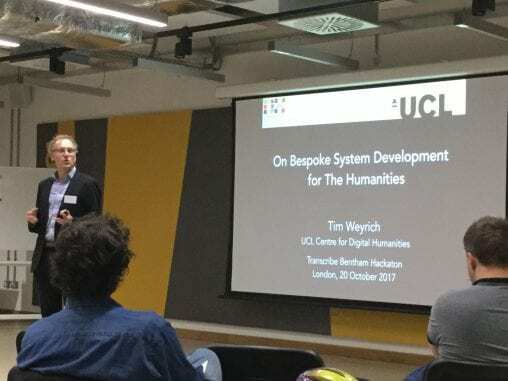 UCLDH Deputy Director Tim Weyrich (Professor of Visual Computing, UCL Department of Computer Science) opened the event. 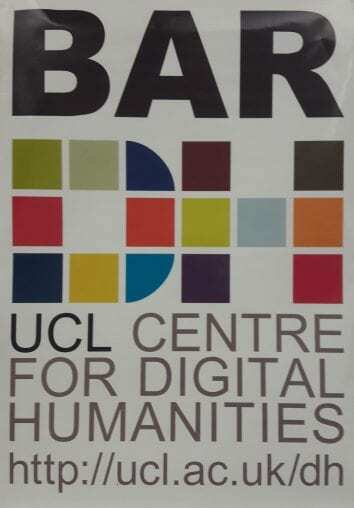 We are very grateful to the Transcribe Bentham Project for enabling us to be a part of the UCL Bentham Hackathon. Our digital assets were made available for the developers to gain access via the IBM Bluemix platform writing applications, back-end services and web interfaces. Many of the team used Watson Natural Language Understanding for concept extraction. The event was excellently run by UCL Innovation and Enterprise and produced very innovative and practical outcomes from the participants. The Transcribe Bentham project is a highly innovative and novel attempt to aid the transcription of Bentham’s work. A digitisation project provides high quality scans of the papers, whilst an online “crowdsourcing” transcription tool allows volunteers to contribute to the transcription effort. The Transcribe Bentham team are now considering the next steps in redeveloping their website and transcription platforms. Enlightenment Architectures: Sir Hans Sloane’s catalogues of his collections is a research project based at the British Museum in collaboration with UCLDH. The project started in October 2016 and will run for three years until 30 September 2019. The objective of Enlightenment Architectures is to understand the intellectual structures of Sloane’s own manuscript catalogues of his collections and with them the origins of the Enlightenment disciplines and information management practices they helped to shape. The project will employ a pioneering interdisciplinary combination of curatorial, traditional humanities and Digital Humanities research to examine Sloane’s catalogues which reveal the way in which he and his contemporaries collected, organised and classified the world, through their descriptions, cross-references and codes. 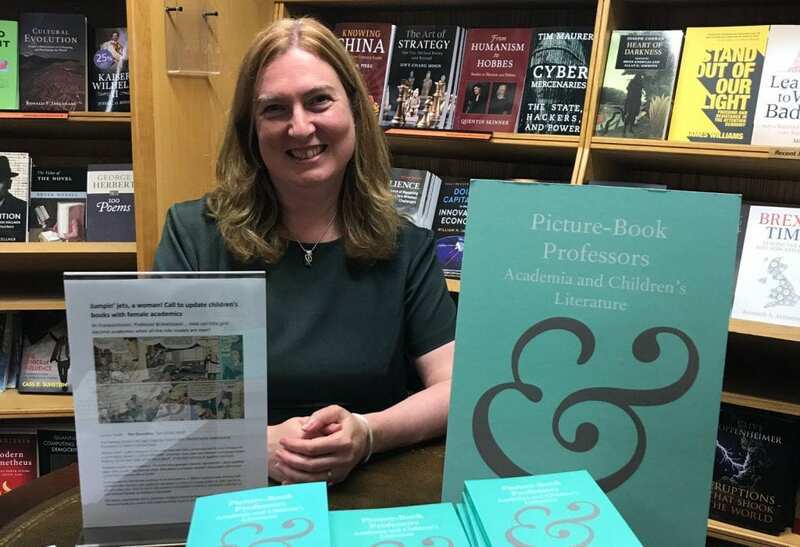 The aim of the studentship will be to use Sloane’s catalogues as a test bed on which to conduct research on how digital interrogation, inferencing and analysis techniques can allow new knowledge to be created about the information architectures of manuscript catalogues such as those of Sloane. The proposed research must also have a strong critical and analytical dimension so that it can be set within our wider framework of academic inquiry that is concerned with understanding how collections and their documentation together formed a cornerstone of the “laboratories” of the emergent Enlightenment. 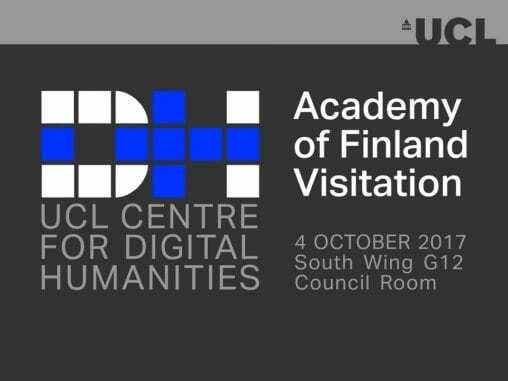 Congratulations to UCLDH team member Martin Austwick (CASA), who is involved in a project that has just been awarded a major grant from the AHRC. He, and other members of CASA, will be working with Survey of London on a three-year collaboration exploring the Whitechapel area, to develop an online platform to find new ways to engage audiences with the work of the Survey. Martin has written a blog post about this, and another Bartlett-funded collaboration with Survey of London focusing on the Oxford Street area.